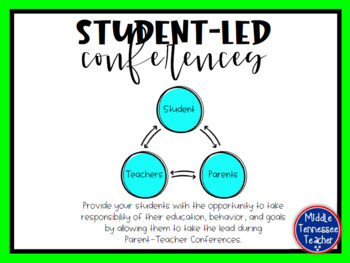 Give your students more independence and responsibility by allowing them to lead their Parent-Teacher Conference! The students will reflect on their grades for each subject stating why they made the grade they did, and what they can do in the following grading period to improve or keep their grade. The students will also reflect on their behavior, strengths, and weaknesses. They will create goals for themselves and set a plan on how to achieve those goals.